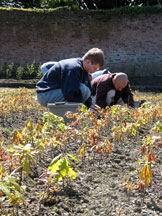 Collect the acorns from the ground in the Autumn, following the first strong wind. Acorns that have fallen onto grass are less likely to have been damaged than those that fall onto hard surfaces. Check that the acorns are healthy. Simply put them into a bucket of water. If they float, they won’t grow, so just plant those that sink. In the short-term, acorns can be stored in bread baskets for a week or two. They must be kept cool and out of direct sunlight. There is normally no further extraction needed with acorns after collection. They can be separated from any twigs or leaves if you have the time, but it is not essential. Acorns are not dormant, so they need no pre-treatment for them to grow. 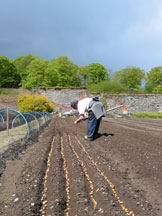 In fact, our main difficulty is stopping them from germinating until we want them to! If they are kept in damp conditions, they will grow very quickly, even without soil. Plant two acorns in a pot filled almost to the top with peat-free compost. Any container will do – a yoghurt pot or root trainer. Make sure there are drainage holes in the bottom, and just cover the acorn with compost (about 2cm deep). Protect the acorns from predation! Mice and jays love them, so cover them over with fine wire mesh to keep them out. If you are sowing outside, sow them in good soil to a depth of 5cm and firm. Aim for a density of about 100 plants in a square metre. This means sowing about 200 acorns. Never let your pots dry out! Stand them in a shady, sheltered spot, out of doors and water, from the top, until the seedlings emerge. From then on, water from below by placing the container in a tray of water and let the compost soak it up through the drainage holes. Water plants in seedbeds if needed. Then wait and be patient. It could be May before the seedlings appear. 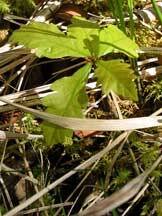 Your oak seedling will grow quite happily in a 1-litre pot or root trainer for the next two summers. Feed with a liquid fertiliser during the summer to encourage maximum growth, but do not over feed! This can scorch the roots. When your oak seedling is at least 200mm (8 inches) tall, it is ready to be planted into its permanent home. Choose a place with enough space for your oak to grow. Remember that it can grow up to 45m high! Prepare the site well by clearing away any weeds or grass and make a hole big enough to accommodate the root ball. Plant carefully in the hole, to the same depth as it was growing previously and firm back the soil.